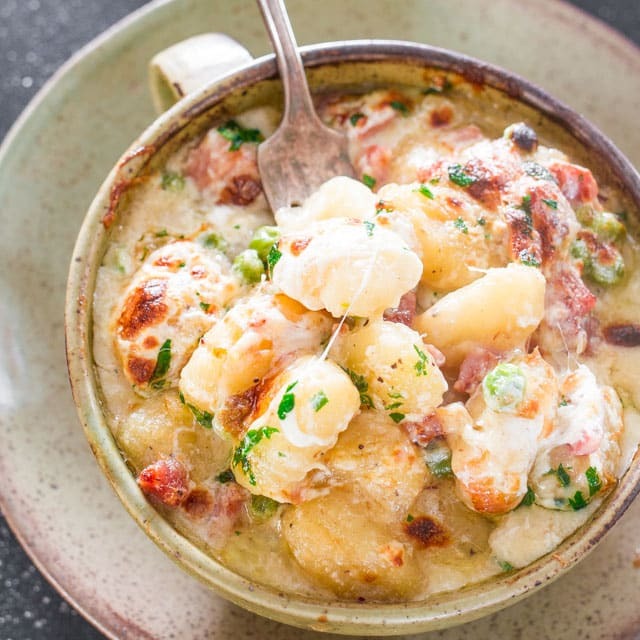 One-Skillet Ham and Cheese Gnocchi – delicious gnocchi paired together with ham and loads of cheese, perfect comfort food. 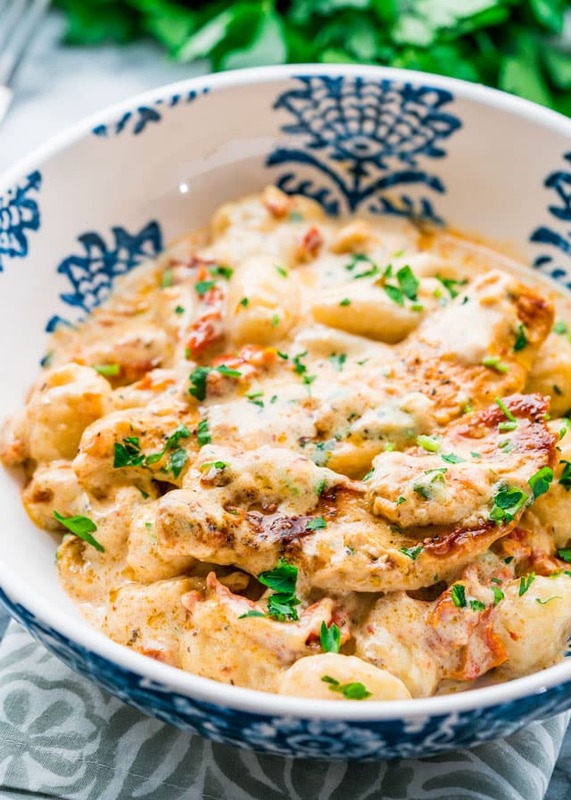 It’s Tuesday and all I want to do is go sit on my comfy recliner, watch some House Hunters shows and eat a bowl of this creamy and cheesy gnocchi. I’ve been putting off making a trip to Costco for 4 days now and this is it. The dog has no more milkbones. That’s not good, she does not understand that there are no more, to her the big box of milk bones is a never ending box of goodies that magically appear and quickly disappear in her belly. Today must be the day we make it to Costco, there is only 1 milkbone left. You see, they have these huge boxes of milkbones, that must have like hundreds of milkbones inside, and it takes months for Mia to go through it. Love them, makes our life that much easier. But as much as I want to just sit and relax, there are a million things going through my head of things to do. Dishes to wash, load the dishwasher, unload the dishwasher, laundry to do, clothes to fold, closets to organize, floors to vacuum and clean, make dinner, etc etc etc. I can’t relax, whenever I sit down and do nothing, I can’t help but feel guilty. You’d think there was someone there holding a gun to my head making me get up and do something. How can one feel guilty of just sitting for 5 minutes and relaxing. Is this just me, or is this normal? It’s like no matter how clean or organized things are, there’s always something that could be better, something else that I could be doing. Yes I know, I’ve got issues, and I’m trying to slow down. So on a stressful day there’s nothing better then some cheesy gnocchi. 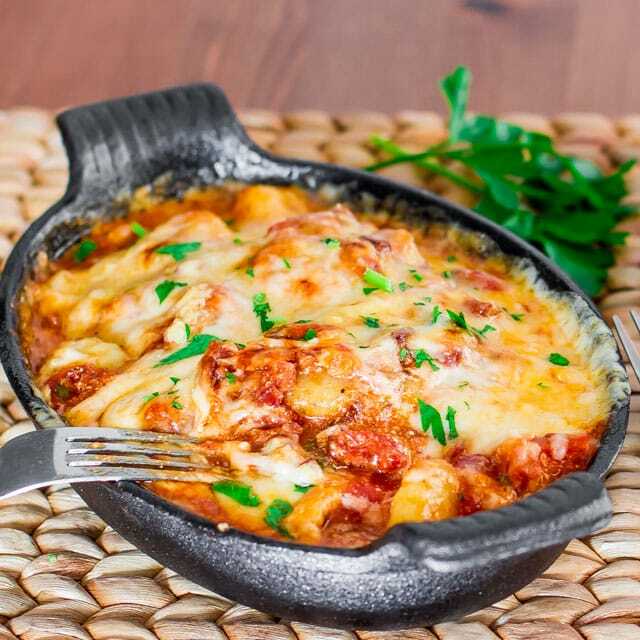 I personally think gnocchi are underrated. 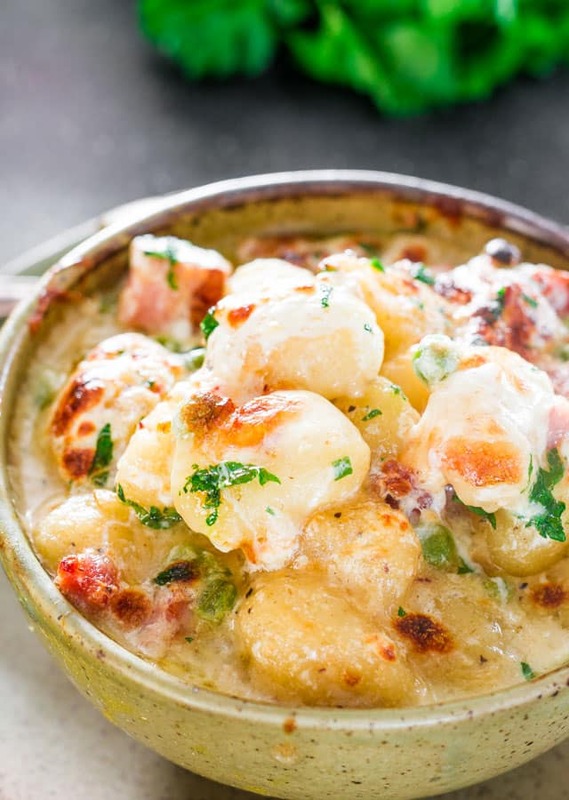 We should have more gnocchi, they’re so delicious and tender, and when paired with great ingredients they could be amazing. But when you have a busy and crazy life you want simplicity. And that’s the #2 reason I love this gnocchi. #1 reason is obviously the taste. 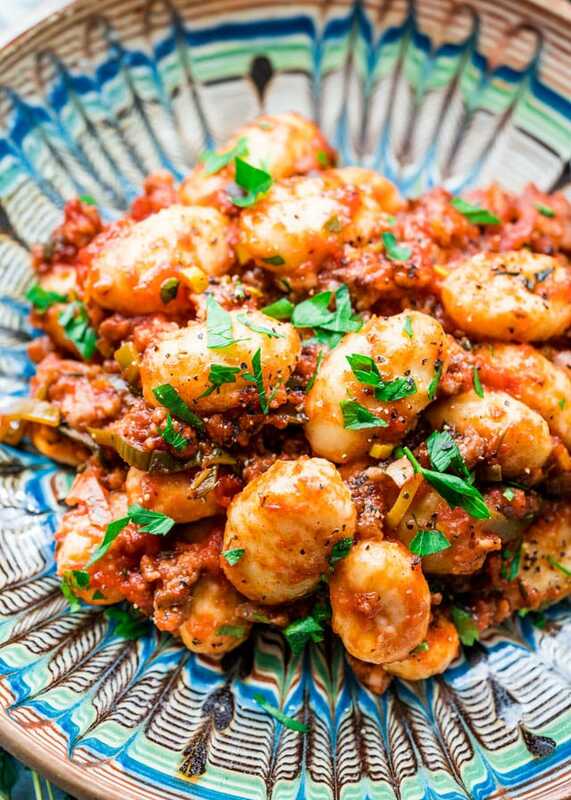 But these gnocchi are easy to make, and require a few ingredients which you probably already have in your fridge right not. I am using leftover ham here, which I’ve had in my freezer from the last time I made ham. Perfect way to use your leftover ham. You also need frozen peas, which you don’t have to worry about thawing them out, just dump them in there frozen. 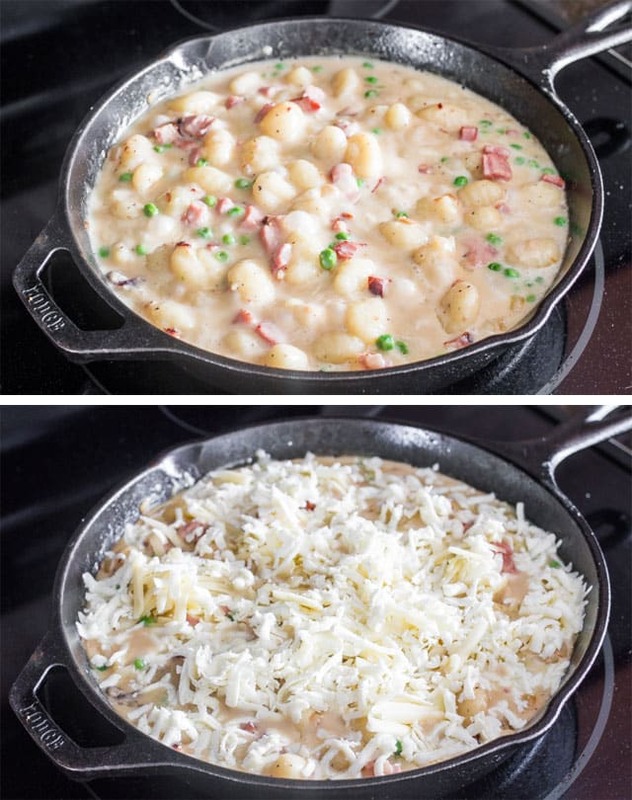 Then all you need is some water and heavy cream and of course your gnocchi. Just cook everything together for about 5 minutes or so just until the sauce thickens nicely. Then my favorite part comes, sprinkle a bunch of mozzarella and sharp cheddar cheese over the top and just broil it until cheese has melted and it’s nice and golden. Ah, perfection! No other words can describe this amazing dish. Comfort Food. 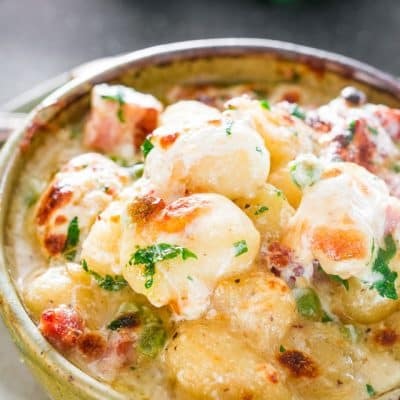 One-Skillet Ham and Cheese Gnocchi - delicious gnocchi paired together with ham and loads of cheese, perfect comfort food. Heat the olive oil in a large skillet. Add onions and cook until tender. 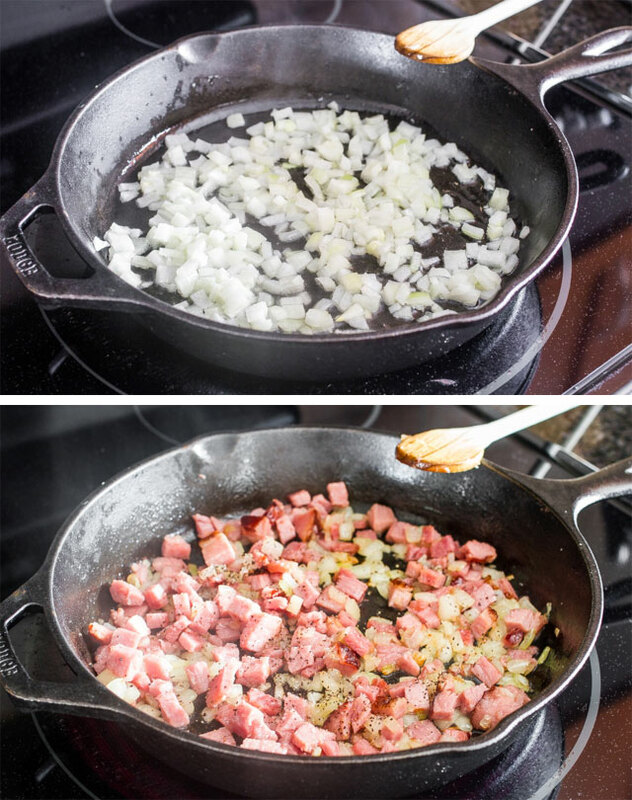 Add ham to skillet and cook until ham starts browning. Add peas to skillet and stir. It's ok if peas are frozen. 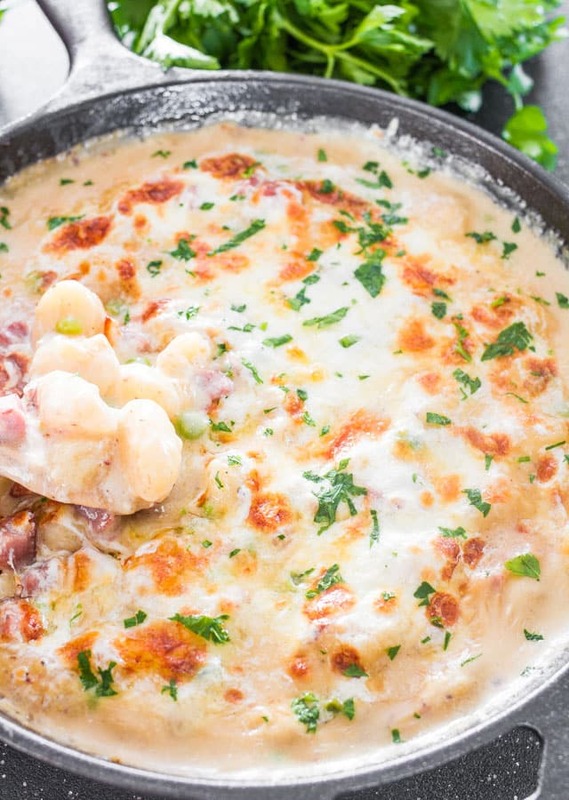 Add gnocchi to skillet, then water and heavy cream. Stir and let cook for about 5 minutes until gnocchi is tender and sauce has thickened. Season with salt and pepper. Sprinkle with cheese on top and place skillet under the broiler for 2 to 3 minutes until cheese melts and start slightly browning. I made this the other night and wanted to tell you it was wonderful! Both my husband and I loved it. I served it with some fresh veggies and garlic bread on the side. I have been asked not to lose this recipe by my husband! This is for sure a recipe to pass down in the family! Thanks so much for it! Just curious, what size is your cast iron? 10″ or 12″? Mine is a 10 inch one. Hi Jo! This recipe looks DELICIOUS and I’m excited to try it tonight for dinner. I am trying to cook more “healthy” friendly meals (especially low in fat and cholesterol). I am going to try substituting fat free half and half for the heavy cream. Do you have any other suggestions for making this dish a little more healthy friendly? 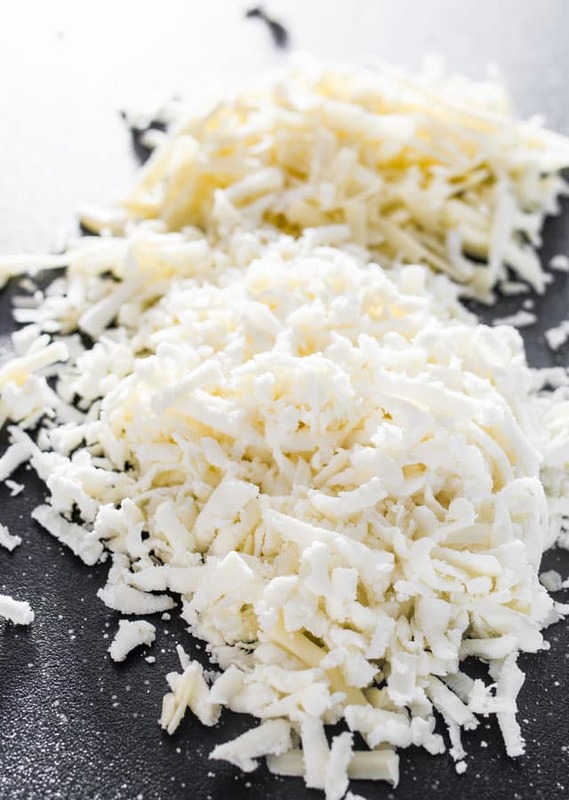 The only other thing I could suggest is maybe use low fat mozzarella cheese. I have lots of “healthy meals” here, feel free to browse the healthy recipes category. This is absolutely delicious and so easy to make. I made this for my family and my picky husband loved it so much he asked me to make it often. Thanks for such a fabulous recipe. So glad you liked it Laurie! Do I cook the gnocchi separately then add it? No you don’t, just add them to the skillet and they’ll cook there. Made this for the family tonight…yummy! Definitely a “comfort food”. Something great and warm for a cold day. Portion size was perfect for four, and the clean-up was a total breeze since it’s all in one skillet. – The dish is already quite salty because of the ham and cheese – I left the salt out completely and I’m glad I did! Hi there! This recipe looks GREAT. I’m definitely going to try it some time. The thing is that i’m argentinian and I don’t really understand what heavy cream isor if I can buy it here. The only cream i can think of is the one used for cakes and things like that. So, could you please enlighten me in this matter? Thanks. Heavy cream, also called heavy whipping cream, is whipping cream with a milk fat content of between 36 and 40 percent. I love the use of Ham in this recipe! 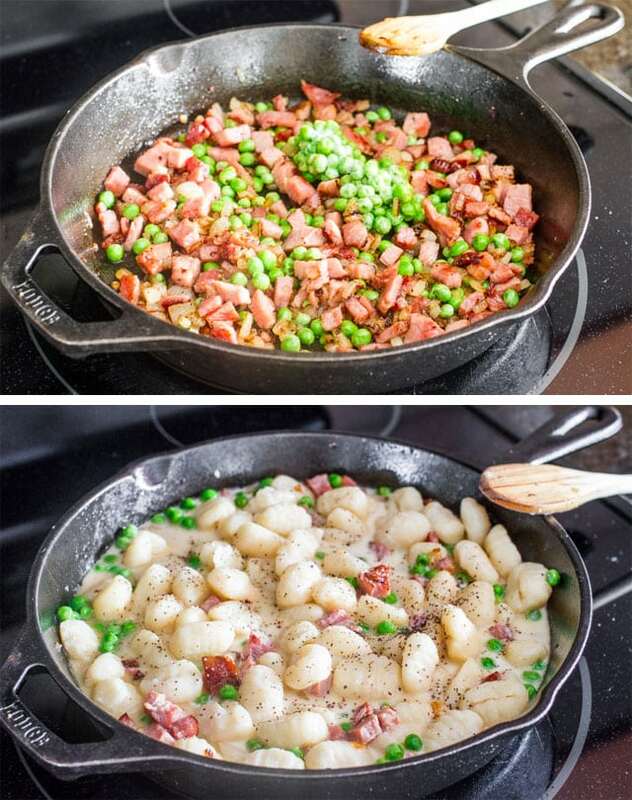 Gnocchi always tastes better with cheese of course, but I love how the ham can give it some protein. Definitely a keeper! This was so good!!!! I used spinach instead of peas and it was just wonderful, my family loved it! !!! All of your dishes are so good!! I look forward to what you are going to present next. I am never disappointed. This recipe is another winner. Oh my lordy, this looks divine! Wow…can’t wait to try this out. Pinned this recipe! 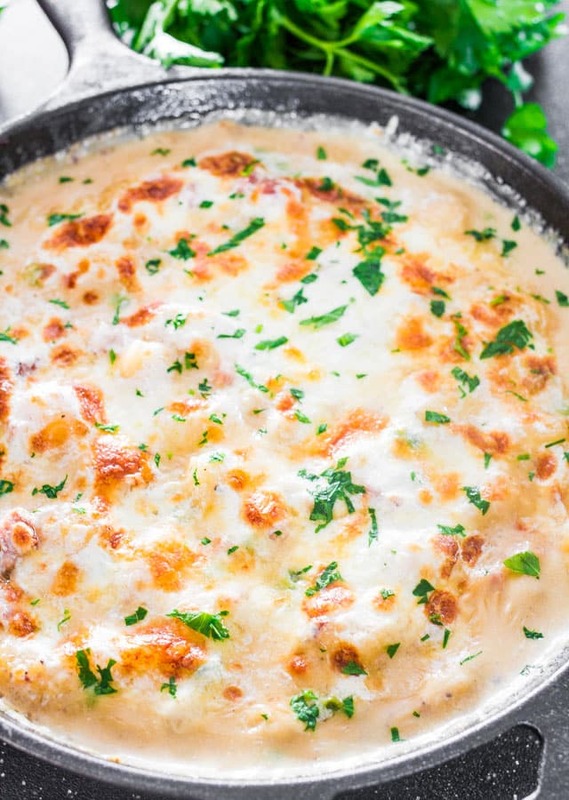 So creamy, so cheesy, so hammy. I’m in love! What a great comfort food for this nasty, nasty weather! LOL, whatever it takes to get us through, right?